Tides for Sandy Hook Low @ 0554h (0.6 ft.) & 1825h (1.0 ft.); High @ 1225h (4.8 ft.) & 0031h (4.2 ft.). Currents in Sandy Hook Channel Ebb: 0314h (1.4 kts. ), 1546h (1.3 kts. ); Flood: 0925h (1.8 kts.) & 2146h (1.4 kts.). Weather from Sandy Hook to Fire Island AM: NW winds 15-20 kts., seas 3-5 ft., PM: NW winds 5-10 kts., seas 2 feet. 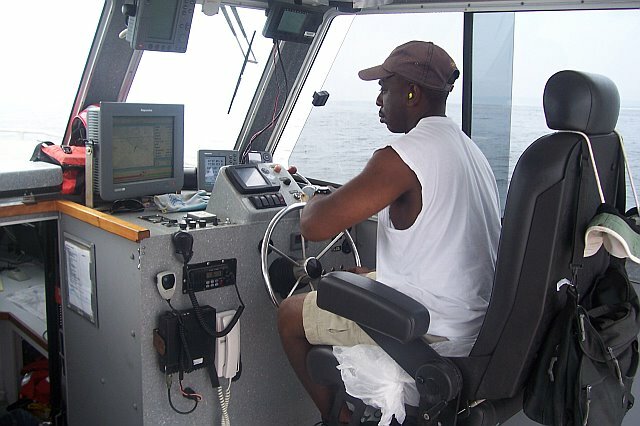 One of the jobs on the ship is coxswain, or “cox’n.” Here, Cox’n Pooser drives a launch. Today is Saturday, but on the ship it’s difficult to tell the work week from the weekend. Just like the previous five days, the launches are scheduled to go out, the data is scheduled to come in, and there is work to be done around the ship. For now deploying the launches has been put on hold until the sea calms down. It’s a windy morning, but crystal clear, cool and beautiful. My one goal today is simple – do laundry! The laundry and exercise rooms are at the bottom of the stairway I use to access my stateroom: laundry to the left and exercise to the right. The laundry room is well equipped with two washing machines and two dryers, soap, bleach and softener. And it is all free! 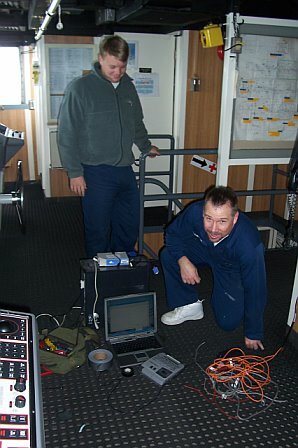 I was able to do two loads, read some side scan sonar material and use the stationary bike at the same time. [A Teacher At Sea of many talents!]. Peter loaned me a good book on the basics of side scan sonar. Its citation is: Fish, J.P. and H.A. Carr. 1990. “Sound Underwater Images: A guide to the generation and interpretation of side scan sonar data.” Lower Cape Publishing, Orleans, MA. I am particularly interested in learning about the history and development of side scan sonar, its applications, and how to interpret the many images we are producing from the launches. In addition, I hope to use some of this information when I write up my lessons for my Teacher At Sea Internship. So I read a few chapters of this book and took several pages of notes. While I was eating lunch I learned that today’s launches will not be going out. The wind is still strong and the seas to rough to risk deploying the launches. And a choppy sea can result in poor data when the launches heave, pitch and roll. [I won’t even get into the sea sickness issue.] Also, today the CO gave me a copy of one of NOAA’s latest publications: Stanitski, D.M., 2007. “Teacher at Sea: Mrs. Armwood’s Hydrographic Adventure on the NOAA Ship FAIRWEATHER.” NOAA publication. It’s a cute but accurate account of Linda Armwood’s trip to Alaska and her TAS internship work on the hydrographic survey. At the time, Linda was a high school teacher from Richmond, Virginia. I can’t wait to read it! As previously mentioned, one part of my internship assignment is coming up with 6-8 lessons that correspond with the science and research being done on the NOAA Ship THOMAS JEFFERSON. I am having a little trouble with this assignment because I have never written “lessons”. As a community college teacher I have written lectures, labs, assignments, etc., but not lessons. After looking over a few examples in the “Teacher At Sea” book, and some sent me from TAS Deputy Program Manager Elizabeth McMahon, I am going to assume that a “lesson” is similar to an “assignment” and work from there. Goodness knows I have been exposed to enough interesting information to produce 6-8 assignments. And I have 90 days to submit them after my cruise. How long have you been working for NOAA? What did you do prior to working for NOAA? How did you “find” your NOAA position? Well, I’ve got some side scan sonar notes to type, dinner to eat, and Roxann to call. Maybe I’ll even spend a little more time on the exercise bike and catch tonight’s movie “Disturbia”. Good night!